TRX City, formerly a unit of 1MDB but now taken over by the Ministry of Finance, aborted the RM7.41 billion (S$2.4 billion) agreement with a Malaysia-China joint venture firm. Prime Minister Najib Razak was slated to make a landmark visit to the Bandar Malaysia site, at the edge of downtown Kuala Lumpur, last Wednesday - the same day the deal was aborted. Signs of trouble came just hours before Datuk Seri Najib was expected to arrive, when the owners of the RM150 billion project began receiving calls from VIPs asking if the 5pm event was cancelled. This was the first time even senior executives at TRX City had heard about such a possibility that would see hundreds of thousands of ringgit wasted on a lavish non-event. A TRX City staff member told The Sunday Times: "We heard about it only from external parties. My colleagues were at a loss for words." Later that evening, the firm announced that the sale of 60 per cent of Malaysia's signature 197ha township had been scrapped. The joint venture firm, made up of Malaysia's Iskandar Waterfront Holdings (IWH) and China Railway Engineering Corp (CREC), is contesting the government claim that it failed to pay up according to an agreed schedule, despite getting more than 10 extensions. This is amid reports that the deal soured due to other demands by the Chinese side, including alleged preferential treatment in the Kuala Lumpur-Singapore High-Speed Rail, which is set to have a terminus in Bandar Malaysia. There are numerous theories as to why Mr Najib decided to cancel the deal. But the main thread has been that China wanted more than Malaysia could give. Deals worth hundreds of billions have been inked with China since Malaysia was rocked by the 2014 oil price crash, culminating in RM144 billion worth of deals unveiled by Mr Najib after a one-week visit to Beijing last October. But these agreements have now come under scrutiny after the government aborted the Bandar Malaysia sale. This deal was to be the flagship Malaysia-China partnership, having been brokered at the government-to-government level, like many other projects aimed at boosting a stuttering economy. Its cancellation deflated optimism in recent months of a Chinese investment theme, as investors withdrew from construction and other companies related to this China play on the Kuala Lumpur Stock Exchange. The Sunday Times understands that other China-linked deals, especially those which have not even reached the stage of legal agreements like the Bandar Malaysia case, are also being held up due to a mismatch in expectations. There are also other direct drawbacks, analysts and stakeholders said. Chinese businesses are protective of their value chain, from materials to workers to even the use of language. At Xiamen University Malaysia - the first overseas campus of the famous institution - in Sepang, Selangor, even canteen staff are Chinese nationals. The menus are in Chinese, and orders are made in Mandarin. This naturally reduces the multiplier effect on the Malaysian economy. SME Association of Malaysia president Michael Kang told The Sunday Times that Chinese firms' ability to price themselves lower should help Malaysia improve its competitiveness. "But if locals don't meet the requirements, they (Chinese firms) should at least do capacity building so we meet their standards," he said of the Chinese reluctance to use Malaysian vendors. Mr Najib's Umno party is headed by warlords who are also mostly big project contractors who depend on major government projects. But the projects have now been carved out by these Chinese companies. If the gravy train stops, the loyalty of the warlords to Mr Najib as Umno's president may also shrink. Said University of Tasmania's Asia Institute director James Chin: "The big boys know they would have to change the way they collect rent. The elites would need to figure out a new way to make money. The problem is how." For the past decade, China's investments and loans in Malaysia have created a political storm, with critics like former premier Mahathir Mohamad worrying that the country will have to pay a hefty price in exchange for money. The recent breakdown of the Bandar Malaysia deal set tongues wagging that Chinese funds often add conditions to their deals. But for Malaysian businessmen, the presence of mainland Chinese comes with another worry. They told The Sunday Times that the Chinese tend to bring along their own skilled and unskilled workers, importing supplies such as steel and machinery from China, and carrying out projects with a speed and scale unmatched by most Malaysian companies. Their massive presence in Malaysia is seen not just in Johor, where projects such as Forest City often capture headlines. In Kuala Lumpur, banners in Chinese are plastered on boards at construction sites where the city's newest skyscrapers are being built. State-owned Chinese firms constructed and invested US$35.6 billion (S$50 billion) worth of projects in Malaysia from 2010 to 2016, according to the World Bank and Statistics Department of Malaysia. However, with China imposing capital controls earlier this year, the investment inflow is likely to dip. Years of sudden and rapid development, coupled with the massive scale of Chinese firms, have ignited fear among Malaysian businesses. Datuk Michael Kang, president of the SME Association of Malaysia, said: "The problem with China is that it will own and control the entire supply chain." Malaysia has always welcomed foreign investments, with the government's open policy helping to boost economic growth via manufacturing in the 1990s, with countries like Japan and the United States setting up factories locally. According to Malaysian business owners, Chinese firms would typically operate independently, with little inclination to get skilled local workers and raw materials from Malaysian companies. "China comes here with a volume game. Of course, local businesses are worried about the competition," said Datuk Kang. Malaysia's imports from China have doubled in the last decade, surpassing Malaysia's exports to the country from 2012 onwards. The uneven trade between the two nations stems from 25 per cent of last year's imports consisting of items linked to construction, according to data from the International Trade Centre. In 2014, during a surge in the number of Chinese construction firms and developers entering Malaysia, imports of contractors' plant and equipment from China amounted to almost RM883 million (S$285 million). With steel imports from China amounting to 8 per cent of total Chinese imports last year, Malay- sian steel companies said they cannot compete with the Chinese output volume. "China developers and contractors link up with Chinese millers, and have been buying steel from them, until the governments imposed rules" to slow this down, said Datuk Soh Thian Lai, president of the Malaysian Iron and Steel Industry Federation. 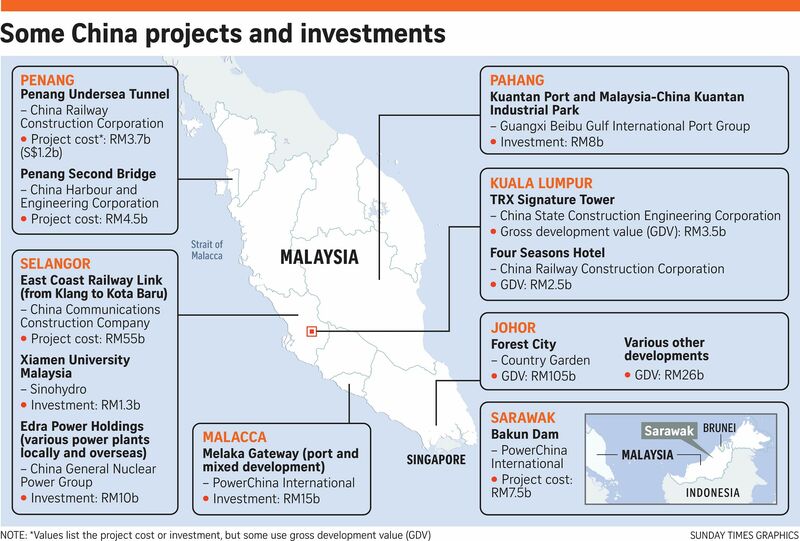 Not only have Chinese firms entered Malaysia as investors, but they are also hired as contractors tasked to build some of the country's projects. One example is the 106-floor Signature Tower at Tun Razak Exchange in Kuala Lumpur. Just 3km away, there are construction works for Four Seasons Hotel and M101 Skywheel. These projects are not owned by the Chinese but involve contractors from China's state-owned companies. With the strong Chinese presence, Malaysia's ruling party may need to play a balancing act, juggling between the Chinese big boys and disgruntled Malay contractors whom it needs for political support. Observers said Malaysia would have to draw up regulations ensuring that some local content is included in large-scale government projects. A RM55-billion railway line linking Kuala Lumpur to the east coast will be built by a Chinese firm. The government says 30 per cent of the work would involve local contractors as part of the agreement with mega-builder China Communications Construction Company. Still, some people think the added competition is good for Malaysia. "What it does is to undercut the cronies," said a fund manager, who declined to be named. Malaysia's business practices, long accused of lacking in transparency in contract awards and deals given to crony firms, may benefit from a forced revamp. "They'll have to either adapt, pick up or do something else to survive," said Mr Oh Ei Sun, a senior fellow at the S. Rajaratnam School of International Studies. China has revolutionised the construction process. We are no match. Malaysian firms can fill in the gaps and upgrade themselves."